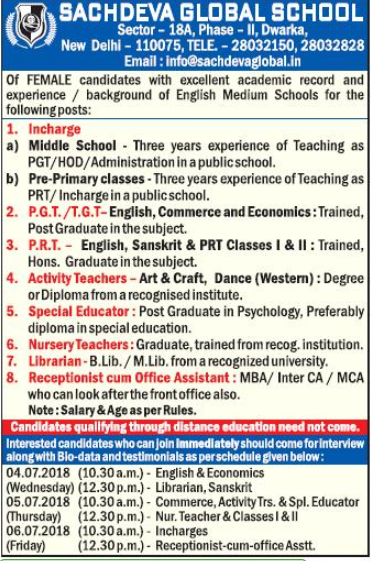 Sachdeva Global School, New Delhi has advertised in THE HINDUSTAN TIMES newspaper for the recruitment of PGT plus TGT plus PRT vacancies. Interested and eligible job aspirants are requested to appear walk in on 4th to 6th July 2018. Check out further more details below. About School: Sachdeva Global School located in Sector 18a, Dwarka, is a recognized senior secondary school which is a dynamic, forward looking community of lifelong learners. The school is governed by the rules, regulations and curriculum of CBSE and is run under the aegis of the "Shri Laxman Dass Sachdeva Memorial Educational Society".